The team at Elgin Corners Dental is always welcoming new patients! 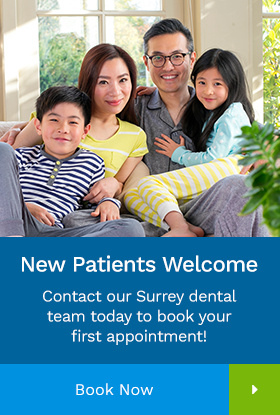 If you're looking for a dentist in the Surrey area, get in touch with us today! During your first visit to our office, we will ask you to fill out a new patient form, which will include your personal particulars as well as pertinent medical history. Once you have filled out the form, the dentist will perform a through dental examination. Next your dentist will sit down with you to discuss your oral health requirements and goals, and together you will devise a treatment plan tailored to your unique needs. To help speed up the check-in process during your first appointment, please feel free to download, print and fill out your new patient form ahead of time. We look forward to providing you with some of the finest quality dental care that Surrey has to offer! For your convenience, we accept payment by cash, Interact, Visa, American Express, and Mastercard. Payment is expected at the time services are performed. When more extensive dental care is necessary, financial arrangements can be made with our office. We also accept payment through a third party financing company called Dentalcard, a division of iFinance. You will only be responsible for your co-payment at the time of service, after which the insurance company will reimburse us for the balance.